Santa’s trousers dropped in the Eaton’s Parade and . . .
Toronto’s Santa Claus Parade was first held in 1905, an idea of Timothy Eaton, the founder of Canada’s famous retail chain. He arranged for Santa to arrive at the old Union Station (now demolished) on Front Street. Having completed his journey from the North Pole, Santa climbed on a horse-drawn wagon decorated with bunting and sat on a packing crate. The wagon journeyed east on Front Street to Yonge, and then north on Yonge to the Eaton’s store at Queen and Yonge. Along the way, he tossed small bags of candy, nuts and trinkets to children lining the route. Timothy Eaton’s son, John Craig Eaton, realizing the potential of the event, continued and enlarged the parade that his father had started. In 1909, the parade terminated at Massey Hall. Waiting inside the building was a multitude of excited children. In one early-day parade, a cart containing five or six real reindeers followed Santa. In 1910, the first costumed characters appeared. In 1917, Santa’s journey again ended at the Queen Street store, where he climbed upon a platform above the James Street entrance. From the platform, he ascended on a ladder into Toyland, which in that year was on the third floor. Santa alighting from his sleigh in 1918 at the James Street entrance of Eaton’s Queen Street Store. The ladder is evident that allowed the jolly old man to climb to the canopy over the doorway. Photo from Ontario Archives. During the years ahead, the parade became larger and the floats more elaborate. In 1920, Gimbal’s Department Store in Philadelphia copied the idea, and in 1924, Macey’s in New York and J. L. Hudsons in Detroit adopted Timothy Eaton’s idea. However, Eaton’s was reputed to be the grandest and most creative of all the parades, setting the standard for the others. In 1928, Jack Brockie, Eaton’s special events manager, was given the responsibility of organizing the parade. The floats and costumes were created in an old factory on Albert Street. Every float, costume, paper-mache head, and prop was created by the staff of Eaton’s Merchandise Display Department. They worked 12 months each year to assemble the parade, the floats built from sketches rather than blueprints. In 1925, after the Toronto parade was over, Eaton’s shipped the floats on railcars to Montreal to create a parade for that city. It was held the week after the event occurred in Toronto. During the Great Depression of the 1930s, Eaton’s stores across Canada were streamlined to reduce costs, but the colourful parade continued in all its glory. For many people, the parade was the beginning of the Christmas season. This has continued into the modern era, although many stores now place festive decorations in their stores shortly after Thanksgiving. My earliest memories of the parade are from the 1940s, when the floats were pulled by horses to save petrol during the years of the Second World War. When I visited Toyland in that decade, it was on the fifth floor. When I asked my mother why there was another Santa at the Simpson’s store, she explained that all other Santa’s were merely helpers. The Santa in Eaton’s Toyland was the real one, as he was the Santa in the parade. I never questioned such a wise explanation. I retain a photo of my brother and me with Santa in the Eaton’s store, my mother standing beside us. The most exciting moment was when I whispered into Santa’s ear my secret wish for my Christmas present. My mother had warned my brother and me that we were allowed one wish each. My brother and I with the “real” Santa at Eaton’s in 1942. In 1948, Charles Thorson of Winnipeg was asked to design a cartoon character distinctively for Eaton’s. Thorson was the creator of Elmer Fudd and the prototype for Bugs Bunny. For Eaton’s, he devised a teddy bear with a thick lock of woolly hair on the top of his head. The bear’s name was Punkinhead, and he first appeared in the 1948 parade. Punkinhead was an enormous hit and inspired a host of merchandising items, as well as a song that sold many records. Punkinhead on floats in 1977 (left) and in 1980 (right). Photo from Ontario Archives. In the 1950s, the parade had over a thousand marchers. In 1954, the theme for the parade was “Rhymes and Fairy Tales from Distant Lands.” In 1956, Eaton’s built a 1.1 million square-foot warehouse at Sheppard Avenue and Highway #400 to stock heavy goods and a service department for the company’s fleet of trucks. Over 15,000 square feet of the building was reserved as a workshop for the parade. In 1957, the theme was “The Parade of Merry Times,” and in 1958 it was “The Royal Road to Toyland.” Some floats were recycled from the previous year, but they were always well disguised. Each year, the most popular float was Mother Goose. Others that were particularly well-received were Cinderella, Gulliver, Sleeping Beauty, Snow White and the Fairy Queen. The most popular song played by the marching bands was “Jingle Bells.” For many years, the band the preceded the Santa float played this festive song. The Santa Claus float was always the largest and most spectacular in the parade, and was the parade’s climax. For many years it consisted of Santa in his sleigh with his team of reindeers positioned above snow-covered roof tops. To increase the visual impact of the float, it was decided that the reindeer should be animated. However, this was technically difficult in a decade without powerful batteries. It was solved by hiring high school to pedal stationary bicycles inside the float. They provided the power that moved the reindeer up and down as it they were flying through the skies to deliver toys. Behind the Santa float was a dark-blue van that contained a doctor, a nurse, and a spare Santa, in case the grand old man had any medical problems. The spare Santa appeared from this van the year that the jolly old man became “too jolly” by drinking more than sarsaparilla juice. By 1969, the parade was 1 1/2 miles long, with 500 musicians and 1100 children in costume. Every child’s costume was individually fitted. To participate in the parade was very competitive as there was a long list of applicants. Eaton’s offered a small remuneration and hot chocolate following the parade. In 1982, Eaton’s decided not to sponsor the parade since its cost exceeded $250,000. Despite over a million people annually lining the parade route and a further 30 million watching it on TV throughout Canada and the United States, it was felt that it did not generate sufficient sales to justify the expense. A non-profit organization stepped in, and with the assistance of various corporations that each provided a float, the event continued. In 2015, the 111th parade arrived in Toronto. It remains as anticipated today as it was in 1905, and remains one of my fondest memories of childhood. I take my hat off to Eaton’s as they were the originators of the greatest event of the yuletide season. The Santa Claus float in 1919 on University Avenue, a short distance north of Queen Street. In 1919, University Avenue ended at Queen Street. It was not continued further south until the 1930s. The Armouries and the Registry Building are in the background, both these buildings now demolished. Photo from the Ontario Archives. The parade in 1925 on Dupont Street. Photo Ontario Archives. Zeppelin Airship in the parade in 1935 on University Avenue a short distance north of Queen Street West. Photo from the Ontario Archives. Mother Goose in 1936 on University Avenue. The corner of the old Registry Building is evident in the background. Photo from the Ontario Archives. Float on Yonge Street in 1962, with Eaton’s College Street in the background (now College Park). Photo from the Ontario Archives. Toyland Train in the 1963 Santa Claus Parade. Photo from the Ontario Archives. Santa Claus float on Yonge Street in 1963. Photo from the Ontario Archives. The “Bed Knobs and Broomsticks” float in 1971 on Yonge Street. Photo from the Ontario Archives. Float on University Avenue in 1974, photo from the Ontario Archives. Upside-down clowns in the 1976 parade. These clowns have remained popular for many decades. Photo from the Ontario Archives. Celebrity Clowns on University Avenue in 2015. Teenagers dressed as dolls on University Avenue in 2015. Float on University Avenue in 2015. Disney’s “The Good Dinosaur,” in 2015. Float sponsored by the Royal Ontario Museum in 2015. The Santa Claus float in 2015. Note: The author is grateful the information provided by the book, “Eaton’s—the Tran-Canada Store” by Bruce Allen Kpoytek, published by History Press in 2014, as well as, “The Eaton’s” by Ron McQueen, Stoddart Publishing, 1998. The Eaton’s Queen Street Store on April 16, 1975. The view looks south on Yonge Street toward Queen Street, the east facade of the Simpson’s Store (now The Bay) visible in the distance. Behind the white hoarding, to the north of the Eaton’s Store (in the foreground), construction is underway for the northern part of the Eaton Centre. Photo from the City of Toronto Archives, Fonds 1526, FL 0084, Item 62. The Eaton’s Queen Street store occupied an entire city block, which was bounded by Yonge, Queen, Albert and James Streets. It was one of the most magnificent retail stores ever built in Canada. I was a young man when it was demolished to build the Eaton Centre, and I must confess that I did not lament its demise, despite having wonderful childhood memories of visiting it. Similar to most Torontonians in the 1970s, I was looking forward to the modern shopping mall that was to replace it and was too obsessed with the future to consider preserving the past. I now regret that I did not pay more attention and take photographs of it before it disappeared in 1977. The northern half of the Eaton Centre, containing the new Eaton store, opened the same year that demolition commenced on the Queen Street store. The southern half of the Centre opened two years later. In future years, it became obvious that the Centre’s Yonge-Street facade had caused the street beside it to deteriorate, as it was a barren wall of concrete, devoid of stores with windows. Many millions of dollars were spent to renovate it to duplicate what the former Eaton’s store had always provided. How much better it would have been if the architects had paid more attention to the facade of the old Eaton’s Queen Street store. Attractive shops at street level provide a more inviting streetscape, and streets that are inviting attract shoppers, customers for restaurants, and tourists. When I was a teenager in the 1950s, I considered the T. Eaton Company so immense that it seemed indestructible. It was a retail and manufacturing empire, spanning the nation from Atlantic to Pacific. When it disappeared, in today’s terms, it was akin to Tim Horton’s, Swiss Chalet, Harvey’s, the NHL, or Canadian Tire disappearing from the scene. Similarly, when I attended Shea’s Hippodrome, the University Theatre, and the Odeon Carlton or the Odeon Hyland, I never dreamt that in the years ahead, they would all disappear. Only the facade of the University remains to remind us of the days when Toronto included many Canadian-owned commercial enterprises, including the largest of them all—Eaton’s. Shea’s Theatre (left) on Bay Street near Queen, and the University Theatre (right) on Bloor Street West. Eaton’s was a retail success story that commenced in 19th-century Toronto. It became one of the most trusted and respected firms in Canada. Its founder, Timothy Eaton, was born in Ireland in 1834 and immigrated to Canada West (Ontario) in 1854, settling in the southwest part of the province. He relocated to Toronto in 1869 and opened a wholesale business on Front Street, near Yonge. However, later in the year, he moved into a rental property at 178 Yonge Street, near the corner of Queen Street, and opened a retail dry goods shop. Timothy soon outgrew the building at 178 Yonge, and in 1883, he relocated to 190-196 Queen Street, a short distance north. He now had 52 feet of frontage on Yonge Street, which provided 25,000 square-feet of retail space. His new shop possessed exceptionally tall plate-glass windows, vastly improving the displays of merchandise. This was a new concept, as although many shops at the time contained large windows, they had numerous small panes of glass. Timothy’s merchandising methods, however, were far more revolutionary. He ended the system of bargaining for the price of goods; he sold all items at an advertised fixed price. The store offered no credit, but if customers were not satisfied with their purchases, the items were either exchanged or the money refunded. Customers were also invited to enter the shop to browse, and were not asked to leave if they did not purchase anything within a reasonable period of time, as occurred in other stores. The public quickly warmed to these new ideas and began flocking to the store. In 1884, Eaton’s acquired its first telephone. Also, an overhead pneumatic tube system was installed. A bill for a purchase and the customer’s cash were placed in a small container and sent through a pressurized tube to a central service counter. The container was returned with the customer’s change and a receipt for the goods. I remember watching this system in operation in the 1940s in the Eaton’s Annex store on Albert Street. In 1886, having grown to employ 1500 employees, Timothy acquired space on Queen Street West, with a frontage of 31 feet. This doubled Timothy’s retail space. Eaton’s now possessed an “L-shaped” configuration, with an entrance on Yonge and another on Queen Street. The same year, Eaton’s installed its first elevator. As a boy, I remember the elevators at Eaton’s, operated by women in uniforms, who wore white gloves. They called aloud the floors and stated the goods available on each floor. To allow customers to exit or enter the elevator, the operator opened a heavy cage-like set of iron bars that folded back, accordion-style, and then manipulated the actual elevator doors. The same year, Eaton’s commenced closing on Saturday afternoons during July and August to allow employees to enjoy the summer weather. To compensate, special sales were held on Fridays. Other stores remained open all day on Saturdays during the summer, but their profits were less. My great Uncle Jim worked at Eaton’s in the 1920s, and was extremely loyal to the company as he had a cottage in Long branch. He was grateful to be able to depart to visit it on Saturday afternoons, during the summer months. Today, it is difficult to imagine Long Branch as cottage country. In 1889, Eaton’s expanded with another section added to the complex, its west facade on James Street and its north facade on Albert Street. Next, the retail space on Queen Street was doubled in size. In 1891, restaurants were added to the complex, including the Grill Room on the fifth floor and the “Quick Lunch Room” in the basement. Next, a grocery department was opened in the basement. Two years later, a four-storey addition on Albert Street extended the retail space of the store. In 1896, the section on Queen Street was increased to four storeys. In 1903, the mail-order department relocated from the main store to its own building on Albert Street. The year 1905 was when the first Santa Claus Parade was held. By 1907, Eaton’s owned 22 acres of property in downtown Toronto, its retail space within the city-block bounded by Yonge, Albert, James and Queen Streets. Only the small building on the northwest corner of Yonge and Queen was not part of the complex. A building to showcase furniture was acquired on the northwest corner of James and Albert Streets. In 1924, the Georgian Room opened on the ninth floor of Eaton’s; many considered it Toronto’s first fine restaurant. Easter Display in the Eaton’s Store in 1906. Photo, Ontario Archives. Looking north on James Street in 1910, toward Albert Street. Old City Hall is on the left-hand side (west) and Adam’s Furniture Store on the right-hand side (east). Eaton’s eventually acquired the furniture store as well. Toronto Archives, F. 1244, Item 1160a. Statue of Timothy Eaton presented by the store’s employees in 1919. It was located near the Queen Street entrance. When the Eaton Centre was built, it was relocated to the Dundas Street entrance of the store. Today it resides in the basement of the Royal Ontario Museum. It was said that rubbing the toe of the shoe of the bronze figure brought a person good luck. Photo from Wikipedia. Same view of James Street as the 1910 photo, but taken in 1920. In this picture, in the distance, the Eaton’s Furniture Store is visible on the northwest corner of Albert and James Streets. Toronto Archives, F. 1244, Item 1160b. Post card showing the Eaton’s complex in 1920. The view is looking east along Queen Street West toward Yonge Street in 1929. The Eaton’s store is on the left, and Simpson’s (The Bay) on the right. On the north facade of Simpson’s there is a large Union Jack and a banner fluttering over the street that advertises the CNE. Toronto Archives, S0071, Item 7175. View looks north on Yonge Street from near Queen Street on January 12, 1929. Loew’s Yonge Street Theatre (now the Elgin) is on the right, and the Eaton’s store is on the left. Toronto Archives, S0071, Item 6569. The Georgian Room in 1939. An orchestra played here while customers dined. Photo Ontario Archives. The Yonge Street facade of the Eaton’s store decorated for the coronation in 1953. Photo, Ontario Archives. The south facade of the Eaton store on Queen Street on April 5, 1977. Signs in the windows advertise the final sales before the store closed for demolition. Toronto Archives, F 1526, fl 0085, item 9. I was a young boy in the 1940s, and my first memory of the T. Eaton Company was the catalogue that my mother carefully examined each November, prior to our trip downtown to shop for Christmas. It was glossy and colourful, and for me, the section advertising toys particularly exciting. On the day we finally journeyed downtown, my brother and I thought that riding the old square-shaped Yonge Streetcars was part of the adventure. I especially enjoyed the trailer-cars as they swayed considerably as they rattled their way south toward Queen. If we were lucky, we found a place to sit near the coal stove, which was situated in the centre of the streetcar. After arriving at Eaton’s, my mother examined goods on the ground-floor level and then, we went to the basement. This was where there was a tunnel under Albert Street that led to the Eaton’s Annex store. Goods were cheaper in this building, and my mother usually purchased bedding and towels there. In the tunnel, the scent of ice cream waffles filled the air, which seemed strange as the walls of the tunnel contained space for selling house paints. Hot dogs and soft ice cream were two other delights that were sold in the tunnel. I remember that the escalators in the Annex were quite narrow and very rickety. On this visit, it seemed forever before we returned to the main store via the underground tunnel, where the aroma of treats again tortured my brother and me. Today, I wonder if my mother visited the other departments of Eaton’s to build suspense before she took us on the elevator to the fifth floor, where Toyland was located. It was a sight beyond the magic of the “Thousand and One Tales of the Arabian nights.” The huge diorama containing model electric trains possessed rivers, bridges, miniature towns, and mountains with tunnels. The model trains disappeared into the tunnels and then, shot out on the other side. Some of the trains even emitted smoke. The display of board games was endless. Snakes and Ladders, Clue, and Parcheesi were my favourites. The games were manufactured from wood and cardboard, as the use of metal was restricted due to the war effort. There was also an amusement ride, a small train that carried passengers on an imaginary trip across Canada. It was 15 cents for adults and 10 cents for children. To save money, my brother and I rode the train without my mother. The train weaved its way across Northern Ontario, the prairies and into the mountains of B. C. It was great! Of course, the highlight of the trip was visiting Santa, who sat on an elaborate chair in his North Pole castle. The Eaton’s Santa Claus was the “real” Santa, my mother had explained to my brother and me. The Santa at Simpson’s was merely a helper. Most Torontonians were loyal to one store or the other. My mother preferred Eaton’s as she felt that the prices were cheaper. However, we always took the time to view the Simpson’s Christmas windows that contained fairy-tale scenes with animated figures. The Bay Store continues this tradition today. A few years ago, I visited San Francisco during November and visited the Macy’s Store on Union Square; it was like being in the Eaton’s store of my boyhood. The decorations were lavish and the toy section amazing. The restaurant on the top floor was crammed with people, similar to the days when Eaton’s operated restaurants. It is not surprising that Macy’s copied the advertising techniques of Eaton’s, as they came to Toronto many years ago seeking advice on how to create a Christmas Parade. They learned fast, and the Macy’s New York parade survives to this day. Eaton’s Annex Store on Albert Street. The view looks west on Albert toward Nathan Philip Square in front of the New City Hall. Toronto Archives. F0124, fl0003, id. 0031. View on September 25, 1978 of the glass-covered bridge over Queen Street that connects the Eaton Centre to Simpson’s (now the Bay). The south facade of the Centre is also under construction, and is visible in the background of the photo. Toronto Archives, F1526, Fl0090, item 0014. View of the Eaton Centre, gazing northward, on December 15, 1981, when it was decorated for Christmas. Toronto Archives, F1526, Fl 0092, Item 0056. View of the Eaton Centre in 2011. Recent publication entitled “Toronto’s Theatres and the Golden Age of the Silver Screen,” by the author of this blog. The publication explores 50 of Toronto’s old theatres and contains over 80 archival photographs of the facades, marquees and interiors of the theatres. It relates anecdotes and stories by the author and others who experienced these grand old movie houses. 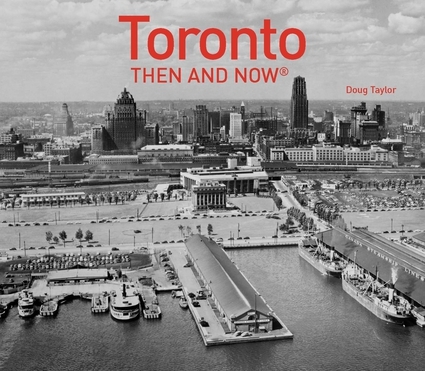 “Toronto Then and Now,” published by Pavilion Press, explores 75 of the city’s heritage buildings. This book will also be released in the spring of 2016.